The Sportage has been an SUV favourite for some time but the latest model adds to the driving fun. With production moved from Korea to Europe, to reduce shipping times and delivery levels of CO2, the Sportage has been given a Euro ‘make-over’ to improve driving dynamics. Now built in Zilina, home of the cee’d, the 2008 Sportage has changed only the front bumper, grille, wing mirrors and headlights on the outside. Under the skin are a number of significant improvements to make the Sportage even more appealing to European customers. The power steering has been re-tuned to be more responsive whilst new dampers provide a firmer ride with less body roll. Braking power has been increased with a change from 15-inch to 16-inch brake discs, transmission ratios have been adjusted and the towing capability has been increased to 1800kgs. Internally, all seats have been remodelled to cater more for European shaped drivers and passengers and the indicator stalks have been moved to left side of the steering wheel as a response to customer and media feedback. Overall the range has been simplified – entry level is the XE, whilst XS adds more kit ahead of the range topping TITAN. Initially a special edition, the new TITAN becomes the range topper offering ESP, electric sunroof, privacy glass, heated seats and automatic rear view mirror as standard. Another first for the Sportage is the availability of a two-wheel drive version, bringing the entry level price down to £13,995 on-the-road. Following further customer demand, a diesel-automatic combination will also be available. With the move of production to Zilina, the most advanced vehicle production facility in the world, Kia is able to provide increased levels of quality control. This means the 2008 Sportage will come with a seven-year, 100,000-mile warranty and an improved corrosion warranty of 10 years. 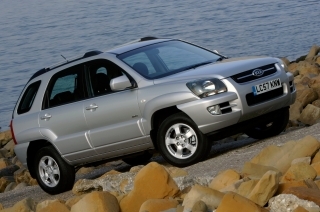 Due to significant demand the 2008 diesel Sportage is available now whilst petrol models will become available in early 2008. The new Picanto enjoys a whole range of updates and the model line-up is adjusted to take advantage of the changes in Vehicle Excise Duty regulations. Priced from £5,995 OTR, the revised 1.0-litre Picanto is now eligible for band B VED at only £35 per year. This saving was made possible as the entry level model is a four-seat version with eco-friendly tyres and upgraded engine, producing an extra 2 PS. The major changes all happen externally with new front and rear bumpers, new headlights, rear clusters, bonnet and wing mirrors. A sporty-looking model will be available for the first time, called the Picanto 3. The range topping model will feature a mesh grille, front fog lamps, black bezel headlamps, 15-inch alloy wheels, heated and electrically adjustable wing mirrors with integrated side repeaters, unique dials, headrests and alloy pedals. The Picanto 3 will be based on the 1.1-litre engine. The full product line-up is shown below. The launch model, Picanto Ice, comes with air conditioning whilst the range topping Picanto 3 adds full iPod compatibility through the new factory fitted audio system. Like the Sportage, and in response to customer demand, the indicator stalks are now on the left hand side of the steering wheel. The cee’d influence continues across the Kia range. In Picanto the cee’d grille and orange dial illumination is adopted along with some interior plastics and the switch layout of the centre console. Paul Philpott, Managing Director Kia Motors UK Ltd. said; ‘The new Sportage is a revelation and another warranty success story for our European factory. 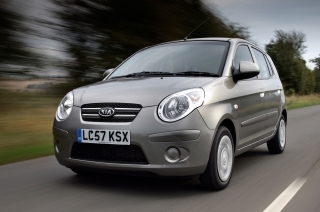 The now famous Kia seven year, 100,000 mile warranty is the longest in market place and we’re proud to lead the way’. He added; ‘The Picanto just gets better with age. It has really grown up and this latest generation offers a well-built, well-rounded package at a highly competitive price. ‘These two additions to the Kia line-up are another step along the development process of Kia in the UK, Europe and around the world showing that Kia lives up to it’s slogan; The Power to Surprise’.